The Shotgun engine for Nuke establishes a bridge between Shotgun Pipeline Toolkit apps and Nuke, Hiero, and Nuke Studio. Because Nuke contains both PySide and Python, the engine is a relatively thin layer that mostly handles menus and startup. The engine exposes several menu handles through its interface, allowing an app to register items on the main menu as well as the node and pane menus in Nuke. This item has been tested and is known to be working on the following application versions: 7.0 - 11.3. Please note that it is perfectly possible, even likely, that it will work with more recent releases, however it has not yet been formally tested with these versions. 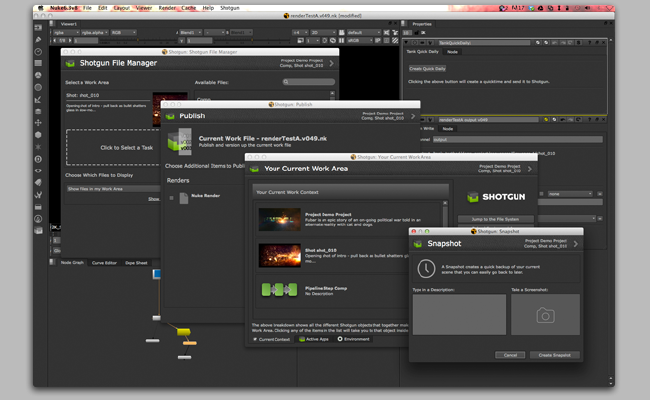 The Shotgun engine for Nuke contains a standard platform for integrating Shotgun Apps into Nuke, Nuke Studio, and Hiero. It is light weight and straight forward and adds a bunch of new things to Nuke. Note: There is currently a bug in Nuke 8.0 running specifically on CentOS 6.5 that causes Nuke to crash when running Toolkit. Other versions of CentOS are unaffected. The Foundry is aware of this issue (bug 43766). If you are running into this, please contact us so we can try and help you workaround it until it is resolved in a future update of Nuke. 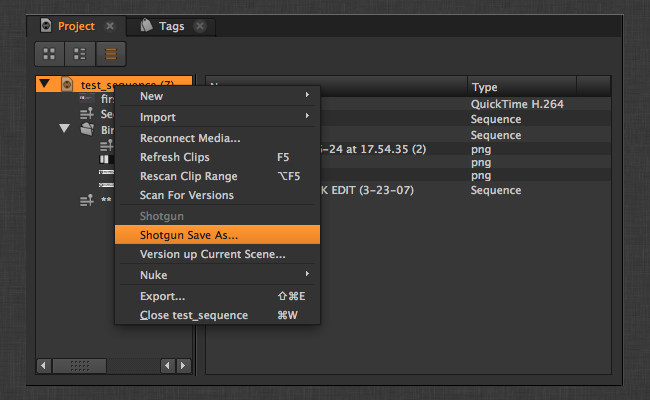 The Shotgun engine for Nuke will switch context automatically when files are loaded. Whenever a file is loaded, the engine will look at the file, try and resolve a context from it. Warning!! Please note that while the use of gizmos may be convenient, it is typically NOT the right solution if you want to create nodes that persist in a scene. The reason for this is because as soon as you have put a gizmo in the scene, you have introduced a dependency between that scene and the gizmo code. Not only will you need to load the Shotgun Toolkit every time you load the scene, but you also need to carefully manage your code so that any updates to the code does not break old gizmos being used in scenes. Any code calling the node from within the app can just use the instance returned. If you make changes to the app behaviour, just keep versioning up the version number on the app callback and that way your app code can support both the new and the old behaviour. 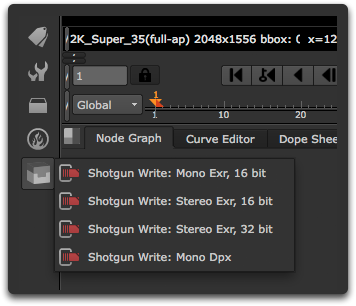 The Shotgun engine for Nuke is also used for Shotgun-aware integrations running within Hiero. It allows you to place Shotgun App actions in several places in the application, both in a specific Shotgun menu on the main menu bar and in the various right click context menus that you find in the different Hiero panels. timeline_context_menu represents the menu you get when you right click on a clip in the time line editor. spreadsheet_context_menu represents the menu you get when you right click on a selection of items in the spreadsheet editor. bin_context_menu represents the menu you get when you right click on a selection in of items in the bin editor, where you see all the different projects and media. In order to add items to these menus, just make sure that the name field you define in the config matches what the App is displaying on its menus. Some Toolkit Apps requires a notion of a default scene or default project. For example, the snapshot app knows how to snapshot the current scene. However, unlike Maya or Nuke, Hiero does not have a concept of a current scene. Several projects can be opened in Hiero at the same time. Therefore, you often need to add special logic in your hooks to help an app (like the snapshot app) to find out which project is being clicked on. We show how this works in the following doc sections. Returns the list of Hiero objects selected in the most recent menu click. This list may contain items of various types. To see exactly what is being returned by which methods, turn on debug logging - this will print out details of what is going on. Get the objects selected in the most recent click, ensure that a single object was selected and that this object is a valid Hiero project. This can be useful for example if you want to trigger save, load or publish operations for a project in Hiero. Returns the UI area where the last menu click took place. This command is less likely to be used - you may need it in cases where you have an app command that you want to behave differently depending on which menu it was called from. Multi Apps configured for Hiero will typically need to find out which project was being clicked on. For example, the tk-multi-workfiles App needs to do a "Shotgun Save As" of a project. 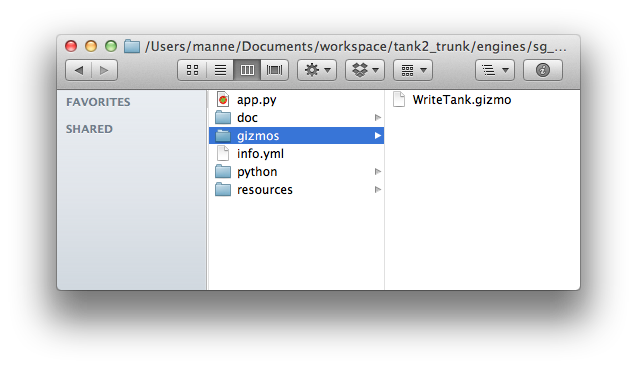 We therefore add the Tank Save As command to the bin menu in Hiero so that a user can right click a project in the bin view and select the Save As option. If you have access to the Shotgun Pipeline Toolkit, you also have access to the source code for all apps, engines and frameworks in Github where we store and manage them. Feel free to evolve these items; use them as a base for further independent development, make changes (and submit pull requests back to us!) or simply tinker with them to see how they have been built and how the toolkit works. You can access this code repository at https://github.com/shotgunsoftware/tk-nuke. Description: Controls which apps are added to the context menu for the timeilne view. This is a list and each item is a dictionary with keys app_instance, keep_in_menu, requires_select, and name. The app_instance parameter connects this entry to a particular app instance defined in the environment configuration file. The name is a menu name to add to the context menu. keep_in_menu is true if this item should be added to the main menu or not. requires_selection will disable the menu item when there are no items selected in the view. Description: Controls which apps are added to the context menu for the spreadsheet view. This is a list and each item is a dictionary with keys app_instance, keep_in_menu, requires_select, and name. The app_instance parameter connects this entry to a particular app instance defined in the environment configuration file. The name is a menu name to add to the context menu. keep_in_menu is true if this item should be added to the main menu or not. requires_selection will disable the menu item when there are no items selected in the view. Description: Controls the favourites section on the main menu. This is a list and each menu item is a dictionary with keys app_instance and name. The app_instance parameter connects this entry to a particular app instance defined in the environment configuration file. The name is a menu name to make a favourite. 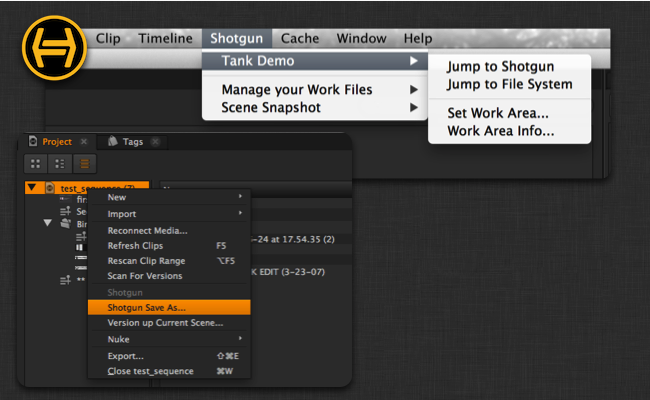 An optional hotkey parameter can be included for triggering the menu action (Nuke only). Description: Adds entries to the favourites section in the file chooser. Description: Comma-separated list of tk-maya plugins to load when launching Maya. Use of this feature disables the classic mechanism for bootstrapping Toolkit when Maya is launched. Description: Specify the minimum Application major version that will prompt a warning if it isn't yet fully supported and tested with Toolkit. To disable the warning dialog for the version you are testing, it is recomended that you set this value to the current major version + 1. Description: Controls which apps are added to the context menu for the bin view. This is a list and each item is a dictionary with keys app_instance, keep_in_menu, requires_select, and name. The app_instance parameter connects this entry to a particular app instance defined in the environment configuration file. The name is a menu name to add to the context menu. keep_in_menu is true if this item should be added to the main menu or not. requires_selection will disable the menu item when there are no items selected in the view. Description: Allows customizing the name of the favourite directory representing the current project root in the file chooser. eg. 'Shotgun Current Project'. In multi-root configs, there will be an entry for each root eg. 'Shotgun Current Project (secondary)'. Specifying an empty string will disable this menu from being added to the favourites automatically. The automatic context switching callbacks are no longer initialized outside of the main engine code. This means you can now bootstrap the nuke engine without having to initialize the callbacks separately. The automatic context switching now uses the engine.context_change method to switch contexts when an instantiated engine is available. This means that the panel app will update its context for example when a user opens or saves a file through Nuke's open menu. The engine now respects that different config environments might have different states of true or false for automatic context switching. In other words, you can go from an environment with it set to True to an environment with it set to False or vice versa, and it will behave accordingly. Standardized the startup and automatic context switching so that they follow the same path regardless of if you are starting up for the first time or spawning a new Nuke instance with automatic context changing. Context changing now works correctly in non-ui mode. Updates logic around parsing Flame openclip files during publish. We now use more reliable means of finding the first video track in an openclip file produced by Flame. We also preserve the openclip version number during our update of its contents. Properly handles "node" type engine commands in Nuke Studio when building menus. This allows us to have something like tk-nuke-quickdailies configured for Nuke Studio without having it show up in the Shotgun menu on the main menu bar. Instead, we now separate out those engine commands and add them to the nodes menu, just like would be the case in Nuke. When publishing it now ensures that the work folder exists before attempting to save the script/project, in both Nuke and Nuke Studio. Updates Flame icon to the 2019 version. Fixed a bug with the publish description for "Submit for Review" plugin. It should now display the correct description, and not cause an error. No longer imports the QWebEngineWidgets submodule from PySide2 on Windows in Nuke 11+. Importing QtWebEngineWidgets from PySide2 on Windows can cause an unrecoverable deadlock in some cases. Since we do not make use of it in any of the out-of-the-box Toolkit bundles or tk-core, we can safely skip importing that submodule. Any clients that require its use can import it directly from PySide2. Fixes engine initialization problems when running in Nuke 9.x. Supports updating of Flame OpenClip publishes when no templates are in use. When no template exists to identify an OpenClip file for the current Shot, we attempt to find a published clip file that comes from the new-style Flame workflow that makes use of the publish2 app during sequence export. If a usable clip is found, we update its contents in the same way we've always done in template-driven workflows. This behavior drives the core of the Flame-to-Nuke workflow. Fixes a regression related to File->New and File->Open operations. Fixes introduced for Nuke 11.x compatibility caused a regression that resulted in a failure to properly initialize SGTK when a File->New or File->Open operation was performed from an already running session of Nuke. Fixes yet another crash-on-close bug in Nuke 11 on Linux. Fixes a crash on close in Nuke 11 on Linux. Fixes a crash on close in Nuke 11. Fixes for menu callbacks in Nuke 11 that caused errors when launching Toolkit apps. Fixed a regression in v0.7.0 where pre-existing NUKE_PATH and HIERO_PLUGIN_PATH paths were not respected. The engine would wipe the environment variable paths and add it own custom ones, causing custom init.py and menu.py files not to be run. It now appends the custom toolkit paths to the end of the existing paths. Plugin support, Software discovery, 0.18 logging and settings for launching at startup. Fixes a bug in Hiero usage reporting. Adds custom equality logic for the Nuke panel wrapper class. Wrapped toolkit panel widgets are now accessible via their parent NukePanel objects. Allows node menu commands to be context specific. Switches to using onScriptLoad rather than onCreate to handle context setting. This change is more efficient than the previous approach, and works around a Nuke bug that causes some node references in Python to not be properly attached to a back-end PythonObject under certain circumstances on some platforms. Fixes a regression in the bootstrap process for Nuke that caused tk_nuke_qt to be inaccessible. Changes a log_warning to a log_debug to reduce noisy output. This is going to be triggered on most launches of Hiero and Nuke Studio, as both will cause a file read of a template file that is unlikely to be stored in an SGTK-aware location. We don't need to be scaring the user with nasty output containing Python tracebacks when it's completely harmless. Adds an event callback for Hiero and Nuke Studio that will change Toolkit's context when opening a project file from File->Open and File->Recent Files if it is different from the current context. Skips triggering a context change if the new context is the same as the current context. Panel apps launch as dialogs when running in Hiero mode. Hiero doesn't support embedding panels into its main window the way that Nuke and Nuke Studio do. As such, we redirect panel requests to show as dialogs to remain compatible. Tweaks for Nuke/Hiero/Nuke Studio 10.0v1 compatibility. Provides bootstrapping as part of Nuke's standard init.py startup. Previously, we only bootstrapped and initialized Toolkit from a menu.py file. This menu.py is only sourced on launch when Nuke is running a GUI session, and as a result, running "nuke -t" did not initialize toolkit. We now have the same bootstrapping routine running from an init.py when Nuke is starting in batch mode. 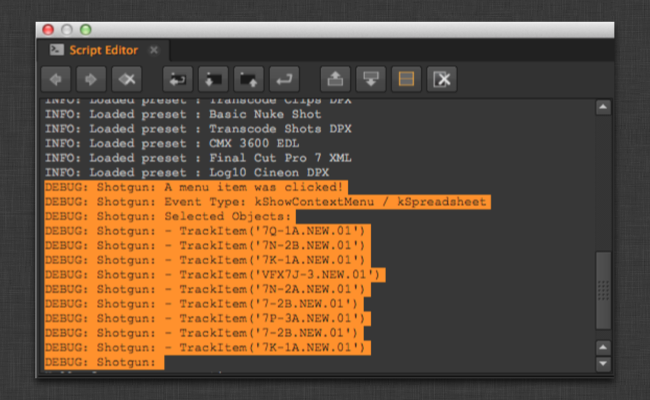 Ensures that we only call clearMenu on nuke.Menu objects. Requires tk-core version 0.17.0 or later. The context-changing behavior of tk-nuke requires functionality provided in v0.17.0 or newer of tk-core. Updated icons and bug fix for context changing. Cleans up context behavior when changing tabs in an empty Nuke Studio session. Adds full Nuke Studio integration. Nuke Studio is now fully supported! 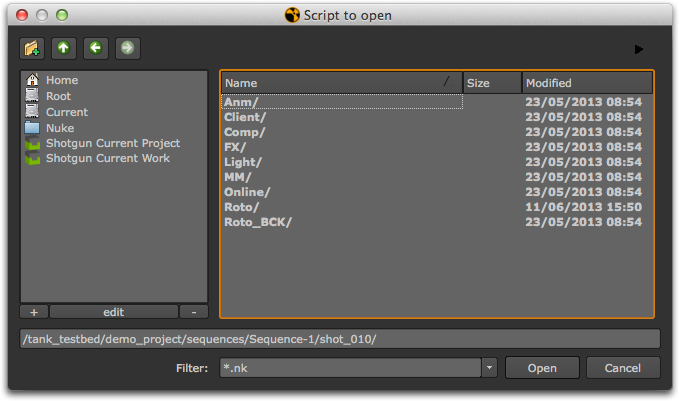 When opening or focusing into a Nuke script within a Nuke Studio project, Toolkit will change to that context on the fly. Hiero 9.0 support has been added to the Nuke engine. This allows for a single engine to be used for multiple modes of Nuke. Also, until full Nuke Studio support is added, the engine will treat it as if it were Hiero, allowing Hiero menus and apps to be used from Nuke Studio. Instructions on how to upgrade to using the new tk-nuke engine with Hiero 9.0, please see this knowledge base article. Fixed an issue causing user login credentials not to be carried over on file open and file. Fixed a bug causing QT import errors when files were loaded via the file manager. Adds panel support and new icons. This implements the panel interfaces added in Core v0.16.15, allowing apps to dock panels into Nukes user interface. Panels can be saved to persist across sessions and launch at startup. This change also switches icons from the old T logo to the SG logo. Nuke 9 is now officially supported. Details: Default compatibility warnings have been bumped to any version of Nuke later than v8.0.x. Added setting to customize name of the "Shotgun Current Project" favourite directory entry in the file chooser. Details: You may also disable it by assigning an empty value to this setting. Details: This update removes the queue interface which was deprecated in Jaunary 2013. If any of the apps you use are still relying on these interfaces, please do not go ahead with this update but instead email us on toolkitsupport@shotgunsoftware.com. Added a setting to control the compatibility warning dialog that gets shown for untested versions of Nuke. Details: - The compatibility_dialog_min_version setting allows you to set the minimum major version of Nuke that the dialog will get displayed for. - If you need to disable the warning dialog for an untested version of Nuke, it is recommended that you set this to the next major version (e.g. 9 if you are using Nuke 8.0v4). Fixed an issue with the error reporting which would cause it to fail when in non-ui mode. Details: Setting allows adding favorites to the file chooser. Thanks to @tokejepson for the pull request! Errors emitted via the log_error() method are no longer shown via UI popups but just registered with the error log. Details: Remove main window parenting for Nuke 7 to avoid a crash on exit where the PySide Shiboken cleanup is happening after the python interpreter has been shut down. Minor adjustments to how the menu items are sorted. Fixed a bug in the menu generation which would cause Nuke 7.x to crash on Linux when the engine was destroyed. Uses new API methods for file system access. UI tweaks and bug fixes. Added icon support for all nuke menu items. Fixed a bug where multi selection would fail when item was substracted from the selected set. New UI and improved menu layouts. New context UI with information about apps and environments. Improved menu with an option to add favourites. The nuke engine now works with project only contexts. Fixed a bug which prevented the menu in Nuke from rendering correctly if the Core API returned unicode strings rather than std python strings. Is Nuke 7.0 supported? I can't get it to show up in Nuke 7.0v8, though if I try to execute 'import sgtk' in the script editor it works (so the engine initialized the correct path environment variables). How is the menu launched and is there a way to debug that? A conflict in the PATH with the Ocula plugin. So it seems to work fine in 7.0! How can we configure the write nodes? I know we can configure the path in the templates file. But what about the name of the nodes? And can you set some of the write-node atributtes? I didn't find the format of the favourite_directories entry documented, so I had to trial&error it. Maybe it's useful. You can run Toolkit with Nuke 8, but you'll get the "we haven't QA-ed this yet" message. A couple of clients disabled the warning themselves and are using Nuke 8 with no reported problems yet (yay! ), and I gave it a try myself to see if anything jumped out and thankfully nothing did.